Australia kicked off their Grand Slam tour attempt with a 19-3 victory over England at Twickenham. The tourists had already lost once on tour, 26-12 to Cardiff at the Arms Park, but were a different beast come the Test matches. Australia' mercurial fly-half Mark Ella scored a try, as he would in all of their Tests on tour. His effort was added to by tries from flanker Simon Poidevin and Michael Lynagh, playing at inside-centre. England's sole response was a penalty from fly-half Stuart Barnes. Paul Ackford was laid out by a spectacular punch thrown by Federico Mendez in the England-Argentina Test at Twickenham. 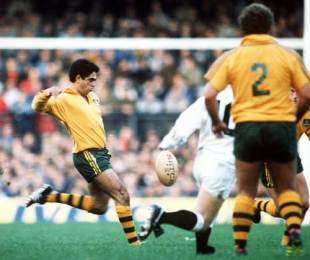 Mendez was sent off and England won 51-0 thanks to two tries from Jeremy Guscott and a hat-trick from Rory Underwood. Mendez reacted following a dust-up at a ruck, sucker punching the unsuspecting Ackford as he stood to the side of the melee. Mendez, only a teenager, was winning his second cap. He would go on to win 75 in a decorated career that included two Heineken Cup victories, with Northampton and Bath. Post-war rugby was gaining momentum. At Herne Hill, then home of the London Welsh club, their captain Claud Davey led by example as the Exiles put together a fine 13-8 victory over a London Districts Army XV. Recent Springbok wing Jan Prinsloo arrived in England to join compatriot Tom van Vollenhoven in the St Helens rugby league threequarter line. Newport and Wales utility back Malcolm Thomas, who won 27 caps between 1949 and 1959 and was the only player to tour New Zealand with both the 1950 and 1959 Lions, announces his retirement from first-class rugby. Canada played at Twickenham for the first time. The tourists were beaten 14-0 by a London Clubs XV captained by popular Saracens lock Vic Harding. Greg Davis's Wallabies kicked-off their short tour of France with a 28-12 win against a French Selection at Lille.